The flavor of Puerto Rico presents itself in many ways. You can find it in the way the people of this island nation love family, friends, and good conversation. It can be seen in the brightly-colored traditional clothing they wear and the fast-paced dance styles they prefer (merengue, plana, etc.). And it can be heard in their distinctive music, which blends world styles to create a sound that is uniquely Puerto Rican. But Here are just a few that you’ll have to try. Lechón. This island delicacy may be a bit difficult for some visitors to take in, mainly because it’s a whole, roasted, suckling pig. But you only have to get a whiff of cooking pork for your stomach to start the rumbling that tells you it’s time to eat. Often, roasted meats are cooked in a Creole fashion with a blend of spices called adobo (including garlic, oregano, peppercorns, and generally a vinegar, lime, and olive oil concoction), but lechón may be flavored in a variety of ways. The one thing that is certain is that the people of Puerto Rico love this dish enough to name a road after it (Ruta de Lechón), so you can imagine that it must be delicious. 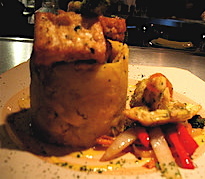 Mofongo. You can’t talk about Puerto Rican cuisine without mentioning the plantain, and cooks use it in a wide variety of recipes. One of the most popular is a dish called mofongo, and you can order it a hundred times and never get the same thing twice. The reason is that it pairs fried plantains with all manner of other foods, including meat, seafood, and vegetables, as well as spice blends that range from sweet to mild to hot. In fact, you can find a mofongo for just about every taste. Even better, this dish is available everywhere in Puerto Rico, so you’ll probably see versions of it at any restaurant you stop in at (as well as any private homes you might visit). Tostones. Although you’ll find plenty of meat dishes to love in this island nation, the population also loves fruits and veggies (although they tend to prefer frying them). Tostones are a simple but classic dish composed of fried slices of under-ripe breadfruit. They are most often used as a side dish, but you may want to try them on their own to get a feel for the flavor. Asopao. This gumbo-like soup most often features a base of chicken, rice, broth, and spices, but it may also include seafood, pork, and a variety of vegetables. It is as popular in Puerto Rico as chicken soup is in America, so you’ll no doubt find it at dozens of eateries. Arroz con gandules. Made with rice and pigeons peas, this common side dish is not nearly as boring as it sounds on the surface. Puerto Ricans love to add spice to their food and a rice and bean dish is one that could use some extra flavor. So it is traditional to add a particular spice blend known as sofrito (onion, garlic, coriander, and more). And many versions also come with meats and vegetables to create a colorful, appetizing, and irresistible medley of tastes. Sarah Danielson is a contributing writer for Grub with Us, where you can find the amazing restaurants in Los Angeles and a variety of attractions and events.